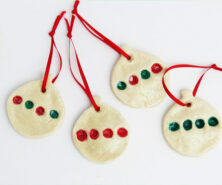 If you’ve visited our site often or follow us on Facebook you know we love handprint crafts. We couldn’t resist a fun summer handprint craft that is bright and cheerful! 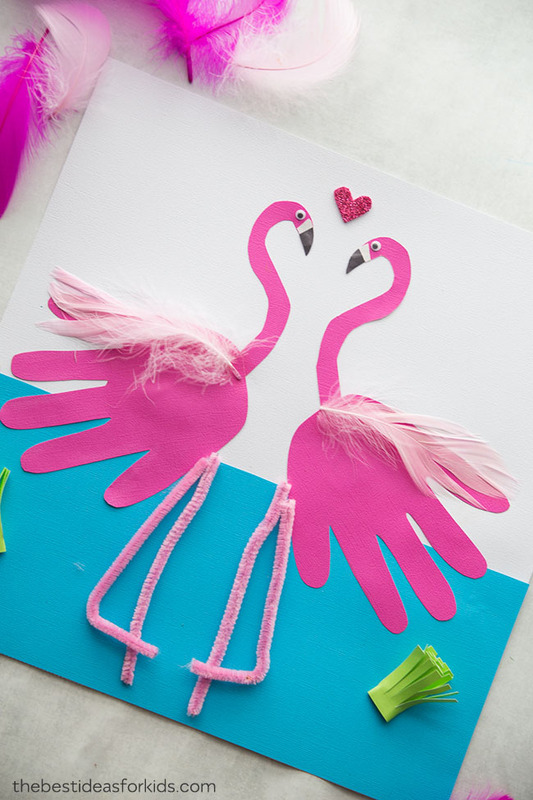 This pink flamingo handprint craft is perfect to make for a rainy day. We love how colorful it is and the added craft details of the feathers and pipe cleaners bring it to life! If you enjoy making handprint crafts like we do, you could even create a scrapbook of all the handprint crafts you do with your children. It would be such a nice way to store these as keepsakes. You can get these page protectors to place inside a scrapbook binder and you can easily slip in the artwork from your kids! 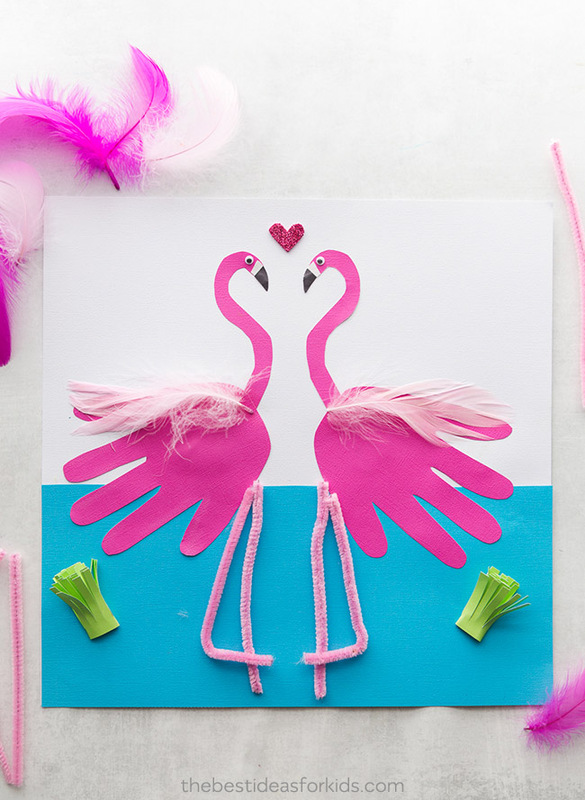 Kids will love putting together these adorable pink flamingos. 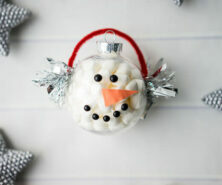 You only need a few supplies and it’s actually a lot easier to do than it looks! 1. First you will want to cut a strip of paper to make the water on top of your 12×12 white cardstock paper. Then glue this down. 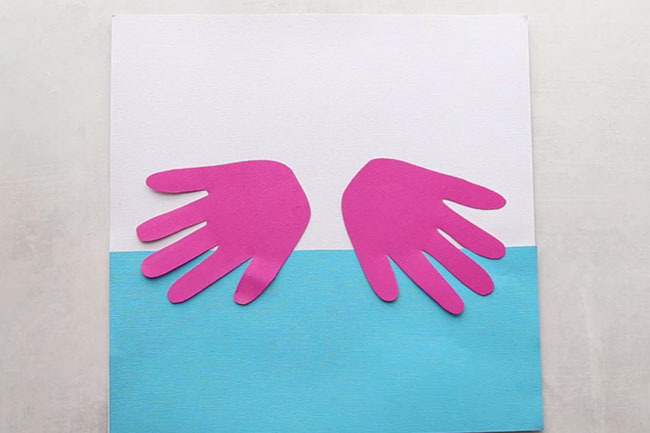 Next trace and cut out your handprints on the pink cardstock and glue this on top of the blue paper. 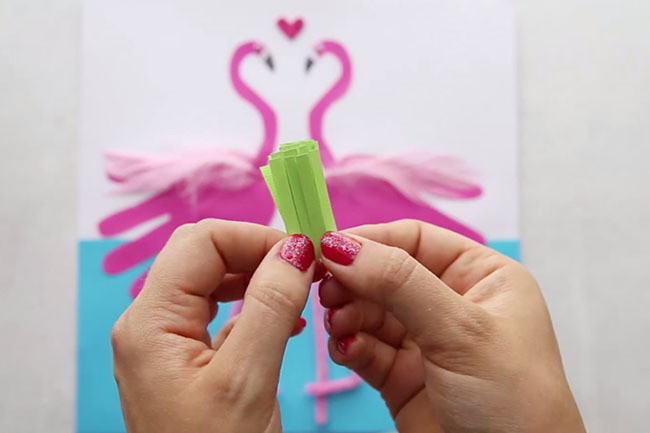 Leave a little bit of space at the top with no glue where the flamingo’s neck will go. 2. Now measure the size you’ll want to make for the flamingo’s neck and head. Draw this on your pink cardstock. 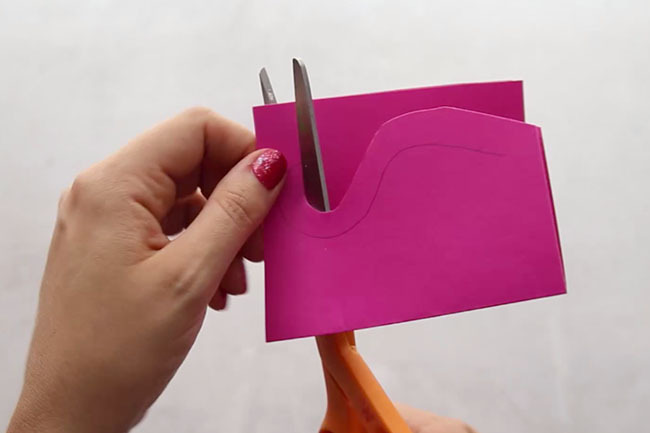 Fold the cardstock over so when you cut you’ll get two necks/heads that are the same size. 3. Glue the flamingo neck and head down by tucking under the handprints. Then cut out two beaks from your white paper and glue down. 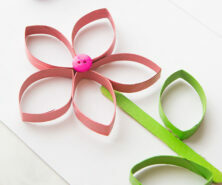 Add a black tip on top with some black cardstock or construction paper. Then glue on two small googly eyes. 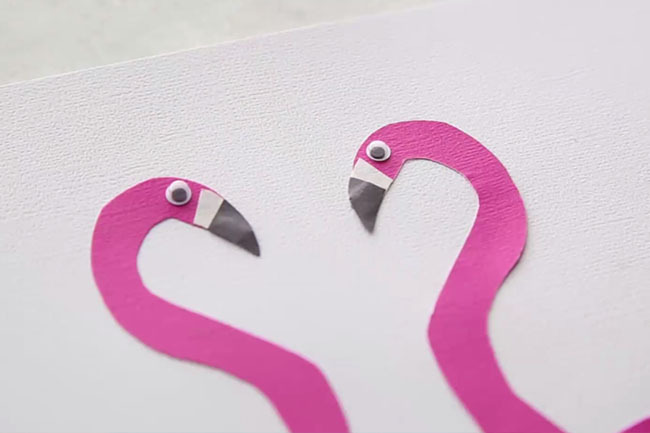 Don’t these flamingos look so cute already? 4. Now to add your feathers and pipe cleaners! For the feathers, simply glue these on top of the handprint. For the pipe cleaner legs, we recommend using this glue to glue these down since it’s much stronger and pipe cleaners can be tricky to glue. Simply glue and then press and hold. Let dry for a few minutes before touching or moving the paper so the glue can dry. 5. Finally, add some green plants to your water by taking a strip of paper and cutting small slits in it. Once you have the paper cut roll it up and glue down to your paper. 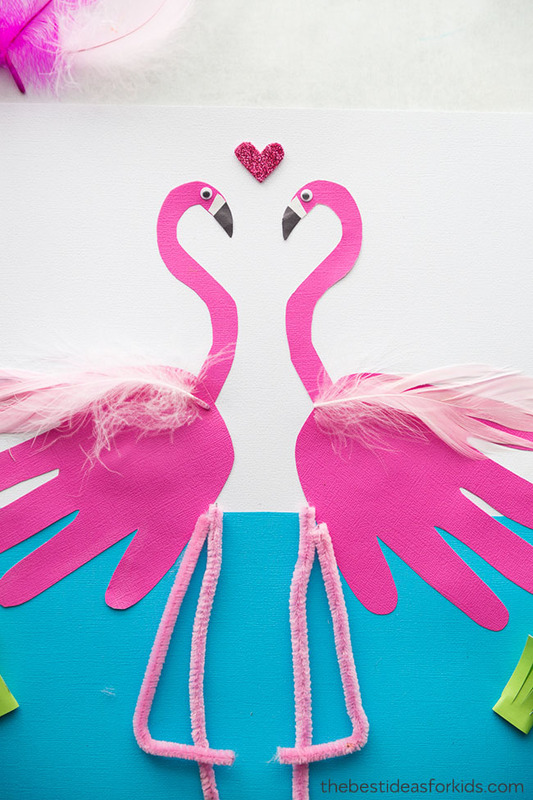 For a final touch, cut out a small heart from glitter paper and add to the top of the paper above the flamingo heads. Do you see the heart the flamingo heads make? 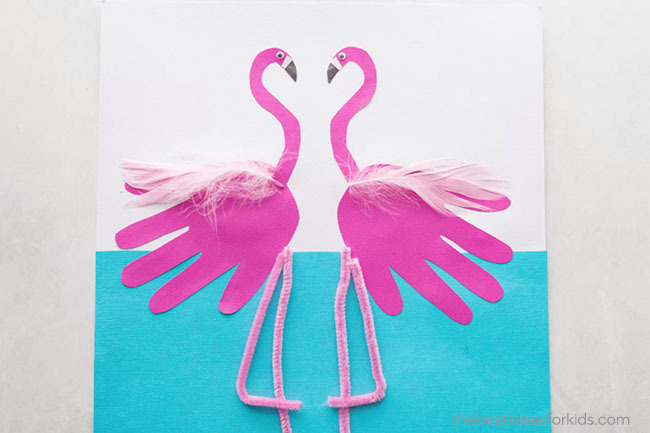 We love how these flamingos turned out! 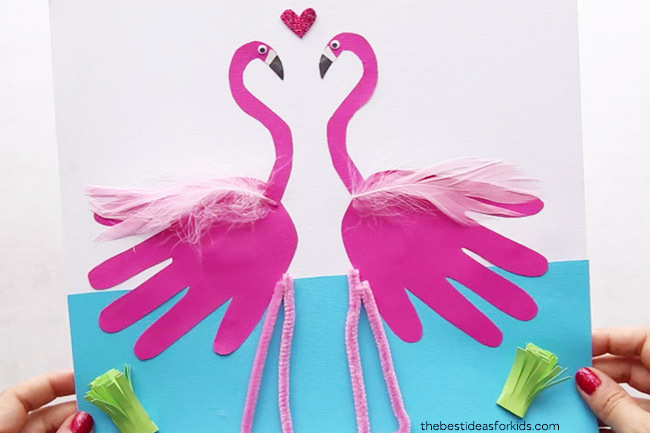 You can also save this idea for Mother’s Day since Mom would love to get a pair of cute handprint flamingos! This handprint frog craft is so fun to make! 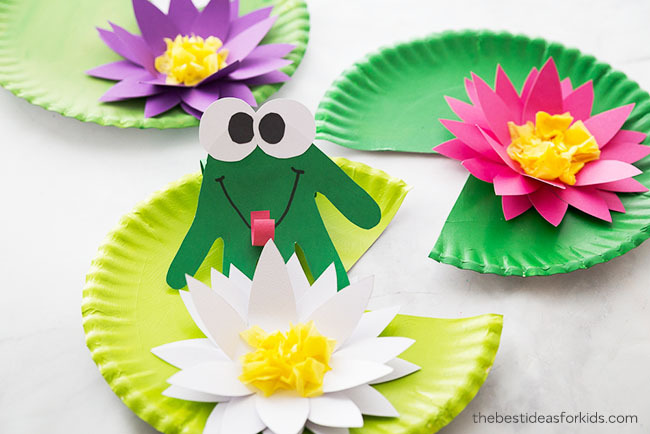 Paper plate lily pads with a free printable water lily template available! 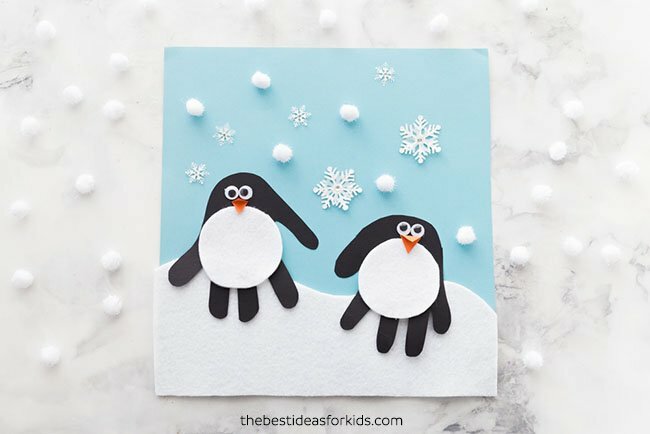 And for a Winter-themed handprint animal craft, see how to make these adorable handprint penguins!